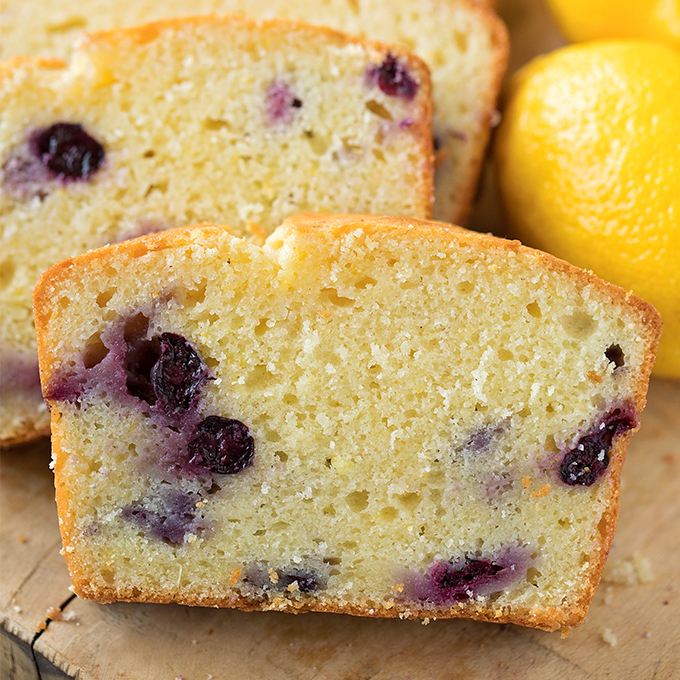 This lemon blueberry bread is a breeze to make. 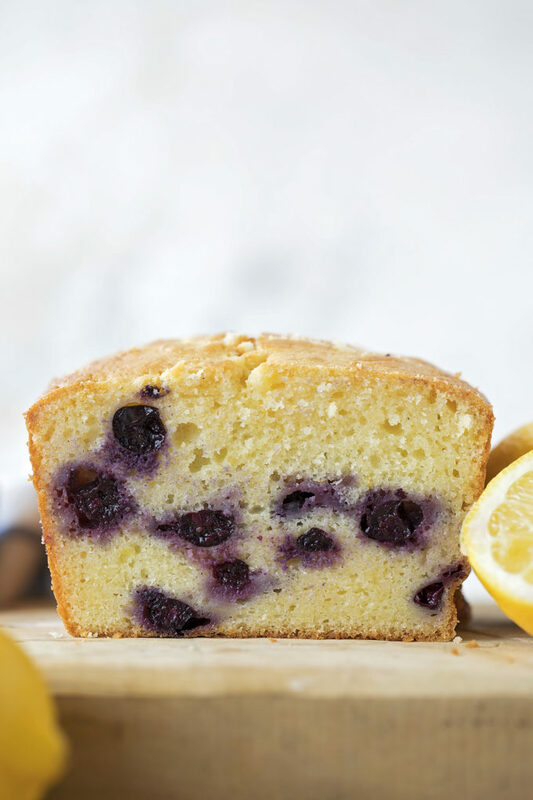 It bakes up light, lemony and full of fresh, juicy blueberries. 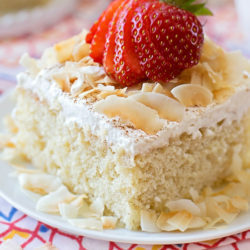 You’ll be baking this all spring and summer long! 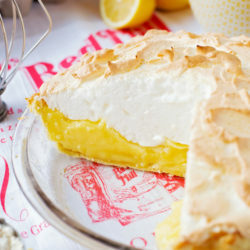 Spring has sprung and all I want to do is bake ALL things lemon! Do you love lemon desserts? I hope so, because I have three more delicious lemon treats coming at you over the next few weeks. I love pairing lemon with poppy seeds or fresh berries. It’s such a divine combo! 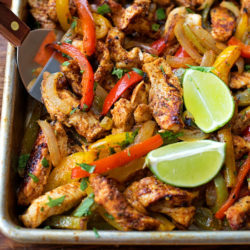 Today’s recipe is one I’ve been really excited to share with you. 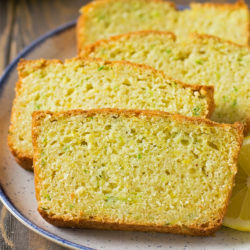 It’s a spin off of our favorite lemon poppy seed bread. It’s incredibly tender, light and fluffy, even with a heaping handful of blueberries baked into it. 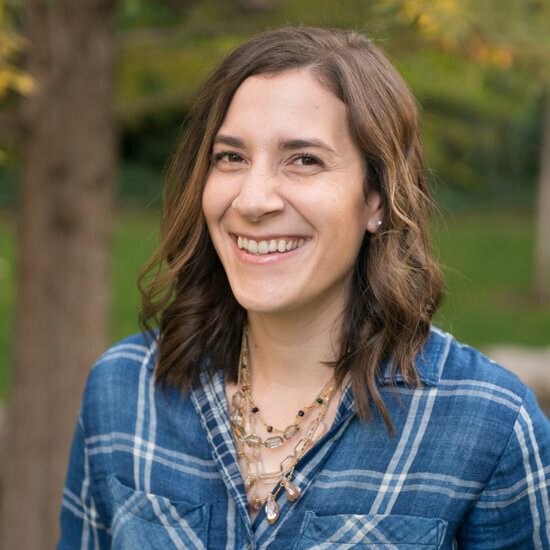 I’m going to share all of my tips for quick bread success. Let’s get started! 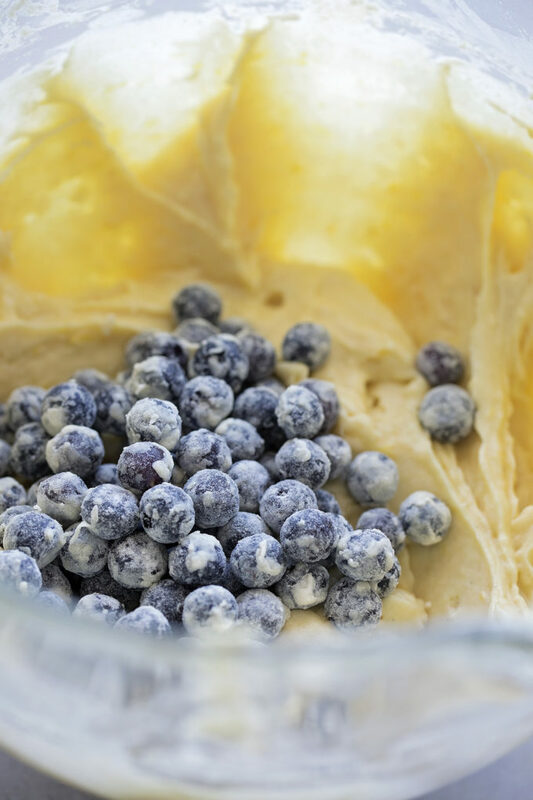 First things first, you’ll need the zest of 2 large lemons or 3 medium lemons and 3/4 c. of petite fresh blueberries. The smaller the blueberries the better. 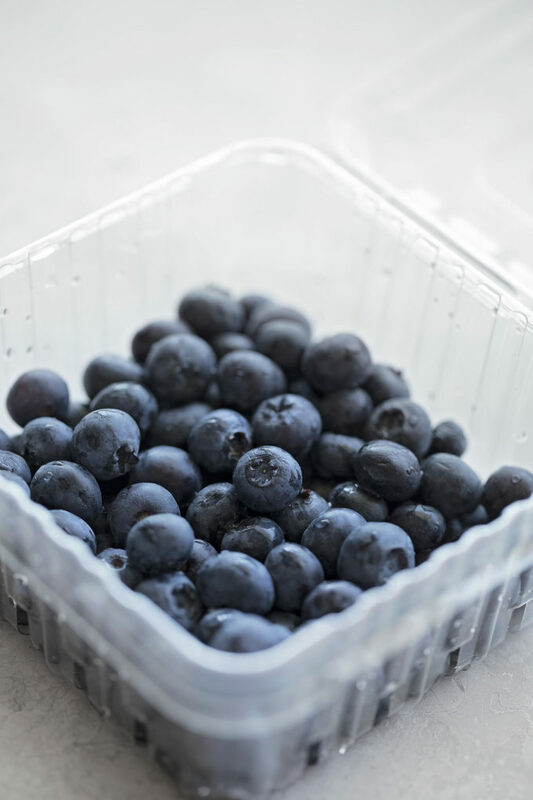 Blueberries are packed full of liquid, which often seeps into the batter during the baking process and can create a soggy mess. We can avoid this by using smaller blueberries and tossing them in flour for a more even distribution. The further away they are from each other, the better. Also, preventing them from sinking to the bottom will help the loaf bake evenly. The batter comes together quickly. Start by creaming the butter and sugar together until pale and fluffy. 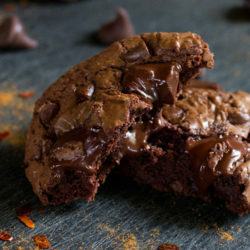 This takes about 2-3 minutes with a stand mixer. The lighter the color, the more tender the crumb will likely be. Next, add the extracts. For this bread I highly suggest using a quality vanilla extract such as Nielsen-Massey. You really can taste the difference. 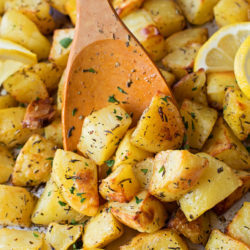 The recipe calls for three tablespoons of lemon zest and two tablespoons of lemon juice. These natural flavors are the only lemon flavors needed. However, if you want the bread to really scream lemon (and I do mean that), you can add 3/4 tsp. 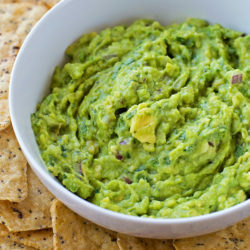 of lemon extract/paste or 1/4 tsp. of lemon oil. Just remember, lemon oil is very concentrated, so you only need to use a small amount! Mix in the eggs, then gradually alternate mixing in the “dry” ingredients and the “wet” ingredients. TIP: Make sure to check the freshness of your leavening agents. They should be replaced every 6 months. I always write the date they were opened on the container so I don’t forget. Old leaving agents = poor reaction, poor texture, poor rise. Keep them fresh by storing them in an airtight container! 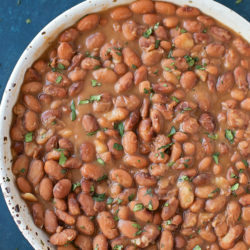 Pour the batter into a prepared 8×4-inch metal pan. Size is important here. Using a large loaf pan will result in a very short loaf. The results will be significantly different. The smaller loaf pan helps push the loaf up, creating a taller, more domed loaf. Bake the loaf at 350 degrees for 45 minutes to 1 hour 10 minutes. Yes, the baking time varies. Each oven is calibrated differently, each climate/altitude is unique. These factors play a huge role in baking times. Just be patient and start checking your loaf at the 45 minute mark. Then again every 5 minutes or so. Tent the top with foil if necessary to prevent over-browning. I have never needed to do this, but you may need to. Enjoy for breakfast or as a dessert! We snacked on it all day long and it was long gone by dinner time. 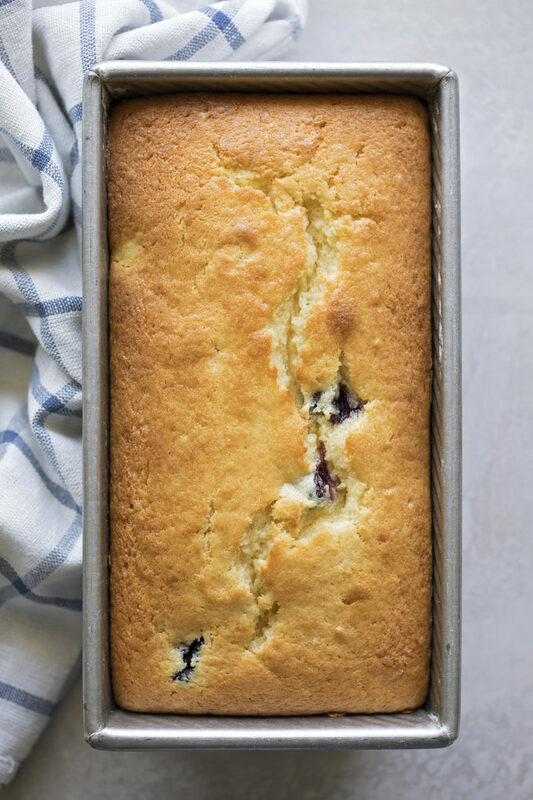 This lemon blueberry bread is so easy and delicious, we will definitely be making it again in the very near future… I hope you will too! 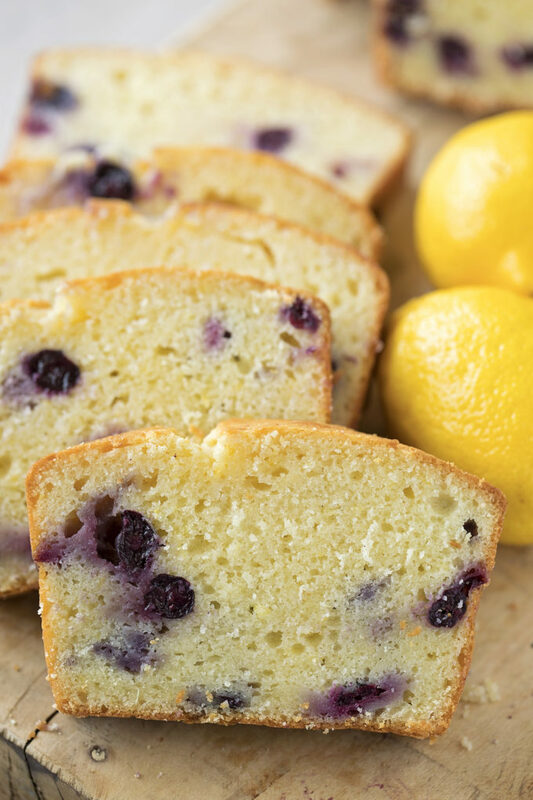 This lemon blueberry bread is a breeze to make. 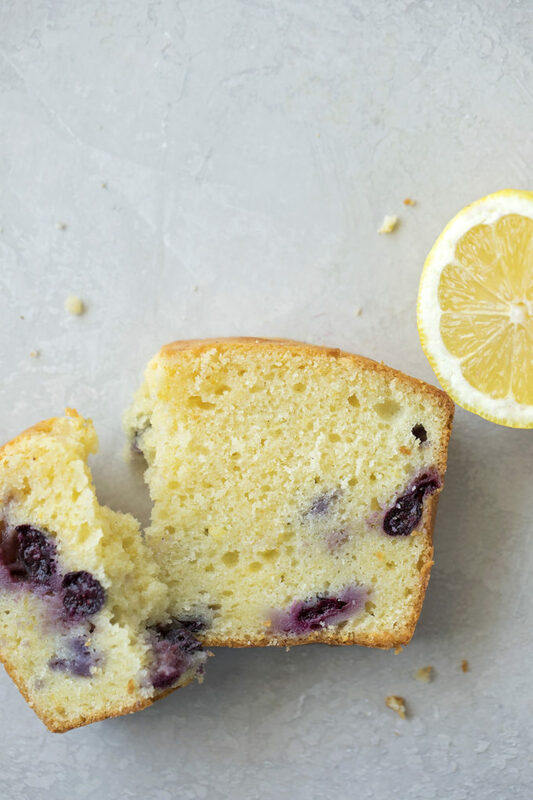 It bakes up light, lemony and full of fresh, juicy blueberries. Preheat oven to 350 degrees. Lightly spray (or butter and flour) an 8×4-inch loaf pan, set aside. Rinse blueberries and gently pat nearly dry. 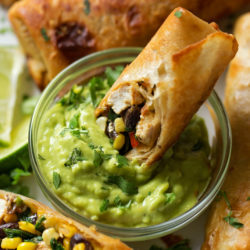 Toss in flour and set aside. In the bowl of a stand mixer, beat together the butter, sugar, lemon zest, and vanilla extract (and lemon extract/oil if desired) until light and fluffy, about 2-3 minutes. Add the eggs one at a time and mix until incorporated. In a medium size mixing bowl whisk together the flour, baking powder, baking soda and salt. With mixing speed on low, alternate adding the dry ingredients and the wet ingredients in three separate additions. Mix until a smooth batter forms. Fold in blueberries by hand using a rubber spatula. Pour batter into the prepared loaf pan and spread into an even layer. Place into the oven to bake for 45 minutes to 1 hour 10 minutes. You may need to tenting the loaf with foil half way through the baking process to prevent over-browning. The loaf may look slightly moist in the center, especially in the crack, but as long as it’s mostly set (not runny) remove it and allow it to cool in the pan for 30 minutes before removing from the pan and transferring to a wire rack to cool completely. -You can sprinkle raw or turbinado sugar on top of the batter for a crusty loaf, or you can add a glaze on top if desired. I love this lemon blueberry bread. As you said, it is so easy to make. Anyway, if some nuts can be added, I think it will be more delicious.